PHANDU T.C. SKELEMANI, Minister for Foreign Affairs and International Cooperation of Botswana, said his country had deferred implementation of several projects of strategic importance following the 2008 global financial crisis. In addition, many traditional partners had virtually abandoned Botswana upon its “graduation” to higher middle-income developing country status, but it now needed more development assistance than ever, due to the gravity of the challenges ahead. He said the coups in Mali and Guinea-Bissau were a reminder of what had been thought to be a “closed chapter”. They undermined the significant progress that Africa had made in consolidating democracy, good governance and respect for both human rights and the rule of law. 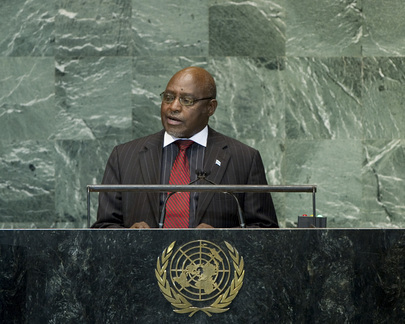 Calling on the African Union to remain resolute in rejecting unconstitutional change, and on the international community to support its efforts, he also appealed to both Sudan and South Sudan to commit to the African Union road map, describing the former as the main cause of instability, with a “catalogue” of blatant acts of aggression against the latter. Turning to Syria, he noted that President Assad had displaced more than a million Syrians and slaughtered 20,000 citizens to satisfy his lust for power, yet his country remained a member of the United Nations. “This surely cannot be right,” he said, emphasizing that Syria’s allies in the Security Council should be equally condemned. The Arab Spring had shown that no amount of force could suppress the will of the people forever, he added. The Council must assume the high moral ground in defence of the victims of war crimes and crimes against humanity, he said, adding that the principle of responsibility to protect should be forcefully applied wherever such crimes occurred. He went on to condemn in the strongest terms the persistent vetoes by China and the Russian Federation of resolutions aimed at exerting pressure on the Syrian leadership to cease its heinous crimes. Botswana also condemned the violence that had followed the release of a video offensive to Muslims, he said, wondering how it could be in people’s best interests for freedom of speech to cause insult. Freedom of expression allowed for protest, but only peaceful protest, he emphasized, adding that the same was true of freedom of the press. “With all these freedoms, there must be limits.” On the environmental front, he recalled that Heads of State attending the Summit for Sustainability in Africa, in May this year, had adopted the Gaborone Declaration, calling for increased private-sector investment to reduce food insecurity, among other things.